In this Data Centre Cleaning Specialist Course you will learn the best practices for the safe and reliable cleaning of data centers and related telecommunications and information technology spaces. We will show you how to understand the risks caused by dirt, dust and debris build-up and how to deal with them. Dust is a major cause of failure of electronic components but cleaning IT equipment in a live data center environment poses its own set of unique challenges. Using the practical experience derived by Capitoline from auditing computer rooms and data centres and assisting customers in improving operations management, the DCCS Data Centre Cleaning Specialist Course focuses on the best practices for the safe and reliable cleaning of data centers and related telecommunications and information technology spaces. We will show you how to understand the risks caused by dirt, dust and debris build-up and how to deal with them. Dust is a major cause of failure of electronic components but cleaning IT equipment in a live data center environment poses its own set of unique challenges. We will teach you how to overcome these. Data centre consultancy is what our instructors do when they are not training. If you have a question they will have the answer. This comprehensive data centre cleaning course covers everything from understanding the problems caused by dust and debris in a data centre and what the international standards have to say about mitigating against issues to identifying the equipment and materials needed and the process and procedures to follow when cleaning a data centre. Failure of a data centre can be catastrophic and very costly. We will explain the pitfalls of working in this environment and how to avoid being the cause of a failure. You will learn how to deal with floods, oil, battery acid, zinc whiskers and more. You will learn how to prepare beforehand, health and safety issues related to cleaning data centers and the importance of producing reports and what should be in them. The course is packed with information and quizzes to help you in understanding all aspects of data centre cleaning. If anything is not clear then our instructors are available to answer your questions. They are data centre consultants with many years experience in design and auditing and assisting customers in developing operations management processes and procedures so you can learn from their practical experience. You can take this course online or alternatively we would be pleased to arrange an OnSite course for you. If you book a dedicated OnSite data centre cleaning specialist course you will also be given access to the online data centre cleaning specialist course Subscription for one year. Access will be granted on receipt by Capitoline of your payment (Note: If booking through a 3rd party this may be later than your payment to them). 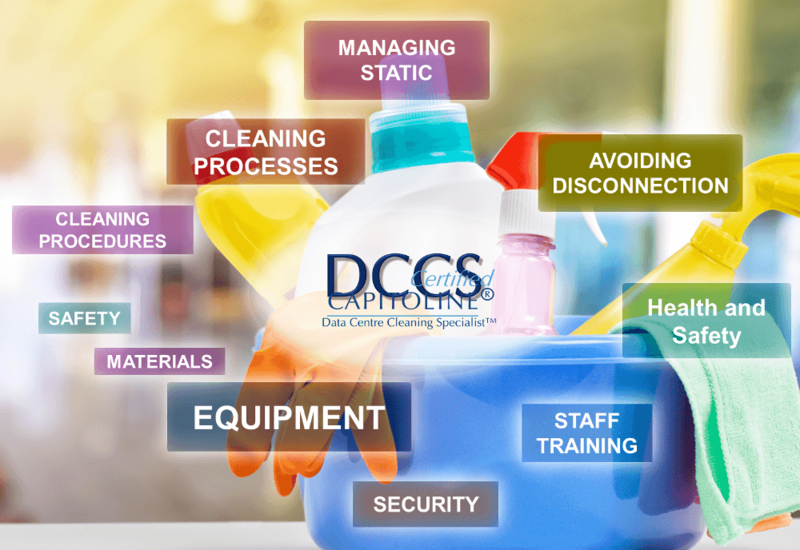 If you complete this DCCS data centre cleaning specialist course and pass the exam you will be awarded a certificate and the right to use the DCCS logo and the DCCS designation after your name whilst your certificate is valid. The certificate will expire three years from the date of issue of the certificate. In order to renew certification, it will normally necessary to pay for and take a renewal examination and to be subscribed to the appropriate course. Near the end of your certificate expiry we will send a reminder to your registered email address to explain the process.